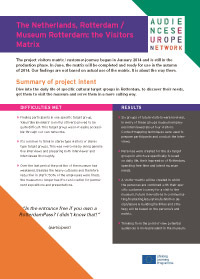 The project visitors matrix / customer-journey began in January 2014 and is still in the production phase. In June, the matrix will be completed and ready for use in the autumn of 2014. Our findings are not based on actual use of the matrix. It is about the way there. 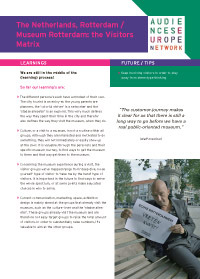 The project's intent is to dive into the daily life of specific cultural target groups in Rotterdam, to discover their needs, get them to visit the museum and serve them in a more suiting way.